Third base for the Cincinnati Reds took a big step forward in the 2017 season. At the Major League level it was Eugenio Suarez had a breakout year at age 25. He hit .260/.367/.461 with 26 home runs. On the farm it also took a step forward as #2 overall pick in the 2016 draft, Nick Senzel, put together a very strong season in his first full year as a professional. The Reds have stated that Suarez is the third baseman moving forward, which puts the current crop of players in a difficult position moving forward over the next few years. In Louisville it was Brandon Dixon who spent a majority of the time at third base. He played 93 games at the spot, but struggled defensively, making 24 errors. 15 of those were fielding errors with the remaining nine being of the throwing variety. As I wrote yesterday, Dixon brings more of his value on the offensive side. There’s legit power in his bat and he’s got speed that he can use on the bases. He’ll be 26-years-old this season, so he likely fits in more as a utility player than a future starting player. In Double-A Josh VanMeter spent most of the first half as the starter after Taylor Sparks went down with an injury in April. 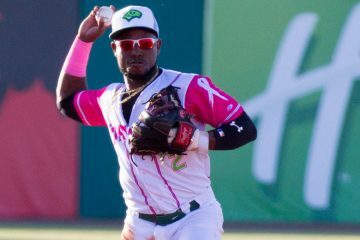 For the season with Pensacola he hit .255/.326/.352 with 53 walks and 100 strikeouts. He also stole 15 bases in 18 attempts. He will be 23-years-old this season, so there’s time for him to continue to improve at the plate, where he will need to show more power if he’s going to be in the conversation beyond a utility player. VanMeter will also need to improve things defensively at third, where he posted a .922 fielding percentage in 48 games played. The second half for Pensacola saw Nick Senzel come up from Daytona. He picked up where he left off and then some. Between the two stops the former 1st rounder hit .321/.391/.514, eventually taking home the Chief Bender Award for Reds minor league Player of the Year at Redsfest. The top prospect in the entire organization is above-average across the board. He can hit for average and power, he’s fast and brings value on the bases, and he’s a strong defender at third base. The Reds have him working on second base and corner outfield spots this offseason, preparing him for a potential move to another spot to get him into the Major League lineup. Taylor Sparks began the year in Double-A Pensacola, but was hit by a pitch at the end of April and didn’t play again for nearly three months. 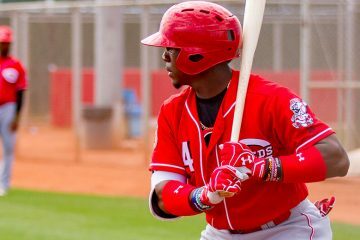 After a short stay on rehab with the Arizona League Reds the third baseman was sent to Dayton for the final five weeks of the season. Between his three stops he struggled to hit for average, with a .199/.307/.398 line. Strikeouts were, and have been a problem for Sparks, as he struck out 31% of the time he stepped to the plate in 2017. There’s big power potential in his bat, he’s got some speed despite not stealing a base in 2017, and he’s athletic with the ability to make all of the plays on defense. While the raw tools are there, the skills still need work. After Nick Senzel was promoted from Daytona, the spot was taken over by Luis Gonzalez for the most part. But, he’s more of a shortstop who was playing out of position and I will talk about him with that group next week. 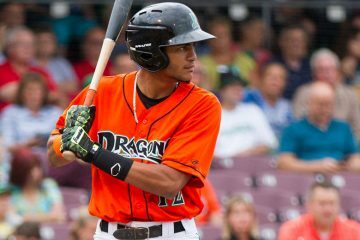 The Dayton Dragons saw most of the time at third base covered by John Sansone during the 2017 campaign. What stands out for Sansone is his power. There’s some pop in his bat, hitting 22 doubles and 13 home runs in just 375 at-bats. He also showed a good walk rate, earning a free pass 11% of the time. But, he struggled to hit for average – posting a .216/.322/.384 line during the year. That was partially due to the fact that he struck out 29% of the time he went to the plate. He will need to cut down on that moving forward if he’s going to improve his average, and more contact would likely benefit his power, too. Defensively he will need to cut down on his errors, which were split almost evenly over his 13 errors in 87 games (.934 fielding percentage). Leandro Santana saw a majority of the time at third base in Billings. The 20-year-old had 60 games at third for the Mustangs. Defensively he struggled, making 19 errors with an .888 fielding percentage. 11 of those errors were fielding, with the other eight being throwing. That will need to improve moving forward. Offensively, things went much better for Santana. He hit .280/.347/.455 in 271 plate appearances. It was the power that stood out as he hit 11 home runs to go with six more doubles and two triples. His walk rate was solid, but his strikeout rate of 26% was a little bit higher than you would prefer. Most of the time at third base for the Arizona League Reds went to 18-year-old Juan Martinez. Like Santana, he struggled in the field. Martinez made 10 errors and posted an .895 fielding percentage. Seven of his ten errors were of the fielding variety. He’s still incredibly young and should improve with more experience. Offensively he hit .220/.323/.305 on the season. He was hit by nine pitches in just 40 games, which is kind of incredible. Martinez showed a good walk rate, particularly for his age, but his strikeout rate of 26% was a tad higher than you want to see. In this series we haven’t covered any players from the Dominican Summer League yet. That’s going to change today. Debby Santana was the only 16-year-old on the DSL Reds in 2017 and he hit .302/.356/.448. That included an impressive 17 doubles, a triple and two home runs. Defensively is where he will need to improve. We need to remember that he was just 16 last season, but he made 14 errors in 31 games and posted an .821 fielding percentage. The third baseman for the DSL Rojos was Jeison Rijo. He was 17-years-old and was one of the top signings from the 2016 international class for the Reds. He hit .310/.390/.465 in 42 games played. That included 14 doubles and two home runs. Like Santana, he struggled in the field. In 21 games played at third he made six errors, posting an .882 fielding percentage. At 17-years-old there’s plenty of time to keep improving. Third base is a very interesting position for the Reds on the farm. Their top prospect plays the spot, though he may wind up somewhere else to start his big league career. Among the guys that played in full-season ball, though, it was only Nick Senzel that looked like a potential starter. It’s the guys in rookie ball, though, that show some interesting potential. Leandro Santana really tantalizes with his power potential. The same can be said for youngster Debby Santana. Jeison Rijo and Juan Martinez has a well rounded set of tools and are still just teenagers with some good performance in the Dominican Summer League under their belts. With the top prospect in the system, and one of the top prospects in all of baseball leading the way, the lack of depth in full-season ball at the position as far as possible other starters doesn’t hurt much. The rookie ball depth provides some long term hope at the position, too. Let’s call third base a strong B. As always,not mentioned was former Stanford Cardinal, Alex Blandino, who played third base for AAA Louisville Bats for 177 and 2/3rds innings in 2017 facing 58 chances, committing 6 errors. Not mentioned because he’s a second baseman and was mentioned in that version of the series. Doug it seems that with almost every prospect in the organization you mention their high strikeout rate. It has been this way for years. Is this a problem with the Reds organization in general? Is it drafting the wrong players or is it a development problem? No, it’s not a problem with just the Reds. You probably just notice it more because you (and I) get to hear about 100+ Reds prospects, and about 5 from other organizations. I suppose one of the better debates right now is who should move, Senzel or Suarez? Do you move the guy who has already moved successfully at the big league level, or the prospect who is a little more athletic but has spent all his time as a pro at the one spot? 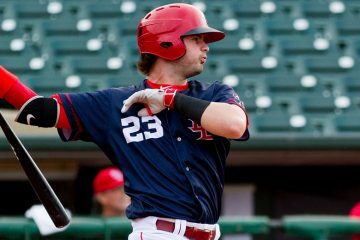 I lean more towards moving Suarez to 2B (I’m not one of the yahoos who think he can go back to SS, eye test tells me he’s at least 15 lbs or so heavier than he was his first year here, not to mention Doug himself said he was slower than Winker on the basepaths last season) and let Senzel stay at 3B and not mess around with versatility. Set it and forget it. Move Gennett back into a super sub role getting starts at 2B/3B/LF/RF/1B as needed and being the top bat off the bench. I am thinking we try Senzel at 2nd base in AAA for a bit, and see how he does. If it does not look good, we try Suarez. Nice to have a problem of two really good 3rd base men. I’d be inclined to set it and forget it as well. The reality will be that Price will follow ‘the book’ and not bump a veteran off a position he earned. There’s some merit to that, but we’ve witnessed far too many instances where veteran privilege has run counter to the needs of the team. Price can’t be trusted in that regard. With 2b/3b set for the foreseeable future, this backlog of 2B prospects need to be leveraged to improve CF/SS/bullpen. Herrera/Blandino/Long/Gennett are expendable, but I’d be inclined to keep one as a backup, preferably the most versatile/cost effective player. Blandino or Herrera? Unless the Reds are able to sign up through arb and a few free agent years…. Duke, I tend to agree with you. I think we may see one of these players used to fill a need a at the all-star break. I don’t like the idea of making the rookie that has flown through the minor leagues learn new defensive positions as aside from a handful of games at SS, he really has only played 3B and 2B since high school. I may be a little old school here, but my thinking is Suarez is settled and we shouldn’t mess with that. It’s kind like when Todd Frazier came up years ago. Rolen was set at 3b and they weren’t going to move him. Suarez’s value to the team is maximized at 3B. He is already an above average defensive 3B, and just got there this past year. Last thing he probably needs is to be moved again. Where as Senzel is fighting for his spot, so he has the expectation of needing to do whatever it takes to make the team. Moves like this affect team moral and dynamics. This shouldn’t trump an obvious move that would better the team, but should be taken into account. Senzel has shown lots in the minors, but hasn’t proven a thing in the majors yet. It’s his job to prove his way onto the roster, and then earn the right to stay at a spot. Long story short, keep Suarez at 3B . Have Senzel get ready for anywhere an opportunity may present itself (3B, 2B, SS, LF, RF). There are always unknowns, and an opportunity will present itself eventually. I get that reasoning. Not really a right or wrong answer with all the dynamics involved. Senzel played 2B for a couple years in college and likely is pretty good there defensively sooner rather than later. I certainly wouldn’t relegate him to a corner OF spot though. Too much athleticism and upside defensively to move him that far down the defensive spectrum. Especially with Scooter being below average to bad defensively at 2B. Do you think Santana or Rijo play in the AZL to start this season? Both? I think we see at least one of them, but possibly both. Mitch Nay, the Rule 5 minor league phase pick, will be in the mix somewhere as well. I’ll be honest – Had completely forgotten about him. With that said, he falls into the “got to show me” category after what he’s been through. Hope for the best, though. He was talented before all of the health problems. Which would you prefer? Let’s assume that the Reds don’t like the prospect of having black holes in the lineup at SS and CF. Further, assume that the current roster is what you have to work with. Would you live with the black holes, move Suarez to SS to get Peraza’s bat out of the lineup, move Schebler to CF to get Hamilton’s bat out of the lineup, or move both of them and throw out any pretense of trying to play defense? Doug, do you have an ability to run polls on here? I’d be curious to know what people think. Do both. Schebler to CF, Suarez to SS, Winker to RF and Senzel to 3B would make one heck of an offense! Play Billy once you have a lead and in big ballparks to maximize his strengths. Peraza makes a good super sub that can cover SS and CF. Our young pitchers might hate it but it’d be a fun team to watch. Come on, guys…. I feel like I have to correct this one five times a week. We’d be below average to bad defensively at SS (Suarez), 2B (Gennett), CF (Schebler), and RF (Winker). The offense may look pretty, but we’d be a bottom 5 team defensively even with plus defense at C (Barnhart), 3B (Senzel), and LF (Duvall, who would likely fare better in RF than Winker). Votto has ranged from below to above average defensively at 1B from year to year, but 1B doesn’t swing the total much one way or the other. That we’d be bad at all 3 up the middle defensive positions 2B/SS/CF would lead to a lot of extra hit/runs given up along with a lot of extra pitches on our young/injury prone pitching staff. Is Rijo any relation to former Reds pitcher Jose Rijo? Just wondering. The mention of Herrera above got me thinking about a comment I read on RLN yesterday. Doug with so many free agents still to sign and most teams having 40 players on their 40-man rosters, most teams that sign free agents will have to drop a player from their 40-man roster to accommodate the free agent. And with a flurry of activity probably expected soon, would this be a perfect time to maybe try to slip Herrera through waivers and try to keep him since he has no options left? The Reds waiver might get lost in the shuffle of activity soon, or possibly other teams might be paying more attention to the waiver wire with teams expecting a flurry of activity on the waiver wire too. Having no options left and with Herrera coming off of shoulder surgery and two seasons of injuries, would a team take the risk and gamble to claim Herrera? It would be a gamble for the Reds to try it. And a gamble for a team to claim Herrera. I just don’t see a team doing that at this particular time. This might be a perfect storm brewing for the Reds to DFA Herrera and still be able to keep him and stash him at AAA. What are your thoughts on this Doug and others? I don’t believe they are related. I can’t imagine the Reds trying to slip Herrera through waivers right now. If they lost him on waivers it would look terrible on the front office, and whether we like it or not, sometimes things like that play into decisions. I do think a team would take a chance on Herrera, too. Especially right now. Maybe not at the end of spring training if he plays poorly/looks real bad. But right now, I think a team would take him and play him. What’s there to lose? You can always DFA him later in the spring if it doesn’t work. Doug- send Suarez, gennett and jeter downs to yanks for gleyber Torres, Acevedo (future closer) and Clarke Schmidt ? That sound reasonable?? Why or why not? Opens up playing time for reds waiting in the wings. Solves Yankee holes. And give the Reds a SS. I think the Yankees would rather just see what they’ve got in Torres. It might be something I would explore if Nick Senzel looks really good at second base, AND the Reds are serious about keeping Suarez at third until his contract is up.